24th Annual Race Judicata 5K. 8:00 am CT. Bay County Courthouse, 300 East 4th Street, Panama City, FL 32401. Entry form and flyer. Online registration at active.com. 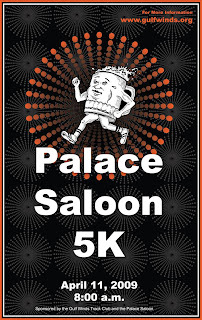 Being co-director with Reid Vannoy of the recently completed 35th annual Palace Saloon 5K, I have been getting more than a few comments and questions about the size of the field this year. People seem interested in how the size of this year's race compares with earlier runnings of the Palace. The records of the race are somewhat spotty, so I can't say that it's the largest Palace Saloon 5K ever, but I can say that it's larger than any other I've been able to find a record for. I also get asked about how the number of participants compares with other races in the area. This is a little bit easier to answer if you can agree on what the question is. I decided to compare the number of registered finishers in the Palace Saloon 5K with the number of registered finishers in other Gulf Winds Track Club races during the previous year (i.e., 12 April 2008 through 11 April 2009). I didn't want to use the calendar year, because then I would have to wait till the end of 2009 to make my comparison. *Single race run in multiple sections. I took the figures from results published at the Gulf Winds Track Club's web site, http://www.gulfwinds.org/. Because the Palace Saloon 5K is a single race, I've chosen to compare individual races rather than entire events. Thus, for example, the Women's Distance Festival 5K and the Women's Distance Festival one-mile fun run are listed separately rather than combined as one event. This seemed fair, and it also made the Palace's numbers look more impressive, so I went with it. The only valid conclusion that you can take from this exercise is that I like numbers a lot. Credit for the number of finishers at the Palace this year has to go to the runners who love this race enough to run it each year, and to the heroic volunteers who served the crowds at registration before the race and at the finish line after the race. These are the people who directly responsible not only for the size of this event, but for the smooth execution that kept a large race from becoming a large disaster. Hats off to ya, and I hope you'll be around for the 36th annual Palace Saloon 5K on 10 April 2010. There should be a bridge on Jackson Bluff Road over Munson Slough. Historically, there has been such a bridge. Jackson Bluff Road ran west to Jackson Bluff, a prominence on the Ochlockonee River that's the site of the Jackson Bluff dam (a.k.a. the Lake Talquin dam). However, in the 1930s Dale Mabry Airfield expanded to the point that the road was cut by one of the runways. Jackson Bluff Road no longer needed to cross Munson Slough, so the bridge disappeared. Dale Mabry Field ceased operation in the 1960s when Tallahassee opened a new airport, and Jackson Bluff Road resumed its old route over the runways. However, instead of Jackson Bluff Road getting a new bridge and railroad crossing, West Pensacola Street was extended to meet up with the Blountstown Highway. For automobile traffic, you really don't need a bridge on Jackson Bluff Road. Drivers can cross the Munson Slough on the Pensacola Street Bridge, or use one of the bridges on the roads that connect Roberts Avenue and Jackson Bluff Road. What would really be useful here is a pedestrian and cyclist bridge. This would connect the neighborhoods west of Munson Slough with James Messer Fields Park. It would also enhance Jackson Bluff Road's utility as a east-west corridor for bicycle traffic--a corridor that points right at the Florida State University campus and downtown Tallahassee. Finally, the Tallahassee-Leon County Greenways Master Plan includes a shared-use trail paralleling the railroad. The bridge would allow people to access the trail from Jackson Bluff Road on either side of the slough. CSX might not be terribly happy about having a bicycle and pedestrian path crossing their tracks, but it would sure beat having another automobile crossing. After checking the weather, and making sure that the Flint River wasn't above flood stage in Albany, Georgia, we decided that it would be a good day to explore the Flint River Greenway Trail. Not that the Flint River is prone to flooding, but the trail is in the flood plain, and is probably underwater during any flood event. In fact, the trail had been underwater a couple of weeks before our visit, and the river was still high. The trail is twelve-feet wide and paved with concrete. The southern end of the trail was near the Vietnam War Memorial in Veterans Park, or very close to the intersection of East Oglethorpe Boulevard (US 82) and South Front Street. From here, the trail descends a short, steep slope to the river, passing underneath the Oglethorpe Bridge to head upstream (roughly north) with the Flint River on your right. Coming out from under the bridge, the trail passes below Ray Charles Plaza, at the top of the riverbank on your left you should be able to see a bronze statue of Charles at his piano. Past Ray Charles Plaza the trail runs underneath the Broad Avenue bridge and enters Riverside Park. Riverside Park has a lot of pedestrian traffic, so don't expect to be able to run or ride swiftly here. Uphill to the left is the Flint RiverQuarium, a uniquely-shaped building that also contains a blue-hole spring. At the north end of Riverside Park the trail goes under a railroad trestle. This is the official start of the trail, or at least where the 0-mile marker post stands. There are mileage posts every half mile from here to the north end of the trail at Cleve Cox Landing. There are also street names painted on the pavement every block, showing you where 1st Avenue, 2nd Avenue, and other Albany street would intersect the trail if they actually made it that far east. Of all the east-west avenues in Albany, only Society Avenue and 3rd Avenue make it over the railroad tracks and through the wetlands to bump into the trail. After about a half mile the trail and the Flint River start to angle apart. Early in the second mile the trail splits to pass under another railroad trestle. North of the trestle, the Oxford Construction Company is on the left side of the trail and the Oxford Environmental Park is on the right. The park seems to have formerly been the sand mine for the construction company; now it has been turned over to whatever wildlife can live there. Nature trails dotted with benches and observation decks run through the park from the greenway trail down to the Flint River. North of Oxford Environmental Park, the Flint River Greenway Trail passes the 1-1/2 mile post and then runs under the Liberty Expressway (US 19) bridge over the Flint River. North of US 19 the trail winds around a pond with an observation deck, and then straightens out to head north to an intersection with unpaved Georgia Power Road. A short side-trip east on Georgia Power Road will take you to a narrow bridge over Muckafoone Creek, from which you can see the Lake Chehaw spillway. If water is going over the spillway you'll be able to hear it from the trail. Past Georgia Power Road the Greenway Trail starts to wind as it passes the two-mile mark. There are also some short climbs on this stretch. Paths to the right of the trail are worth exploring for views of Muckafoone Creek, Lake Chehaw, and the ruins of an old railroad bridge. Continuing on the Greenway Trail will take you to the parking lot for Cleve Cox Landing, a boat ramp on Lake Chehaw. Go all the way to the boat ramp itself to see the last milepost on the trail, marked 2.4 miles. Not quite three miles long, the Flint River Greenway Trail is short but pleasant. It doesn't really go anywhere, so it has little or no potential as an alternative transportation corridor. The trail is principally a recreational trail, and it gets a lot of recreational use. There were lots of cyclists and walkers on the trail during our visit, and hoofprints along the trail demonstrated that equestrians had been using the greenway as well. The trail was originally conceived to run about seven miles from Radium Springs in the south to the Parks at Chehaw in the north, but plans to complete the northern extension of the trail have been postponed due to lack of funds. The Albany - Sasser - Dawson Rail Trail was also supposed to link to the Flint River Greenway Trail, but that project has yet to move off the drawing board. But if you're in Albany and the river don't rise, check out the Flint River Greenway Trail. Georgia also has "bicycle lanes" on many of its highways. These really aren't for bicycles, though. They're cut with deep grooves, possibly to wake up a sleeping driver whose automobile has started to drift off the road. The washboard pattern would more than startle you out of your reverie if you were on a bicycle. It's sort of a "welcome to Georgia!" complimentary pulverization of your vertebrae. It can't do your machine any good, either. If I were riding from Tallahassee, Florida to Thomasville, Georgia, it would certainly encourage me to turn around at the state line. Maybe that's the point. It would explain a lot. If you've been driving on West Tennessee Street (US 90) just west of Capital Circle NW in recent years, you may have noticed a massive stormwater retention pond being constructed south of the highway. That pond-- a joint project of the Northwest Florida Water Management District, the Florida Fish and Wildlife Commission Conservation, the Florida Department of Transportation and Blueprint 2000--will soon be the setting for another Tallahassee-area paved trail, the Martha Wellman Park Trail. This joins the Lake Henrietta Trail and the Lake Elberta Trail as local trails built around stormwater retention ponds. The pond is part of the Blueprint 2000 project to improve Capital Circle NW from the Interstate 10 interchange south to West Tennessee Street (US 90). All the new pavement--from widening the road, adding sidewalks and bike lanes, and improving intersections--creates more stormwater run-off, and that water has to go somewhere, hence the creation of "Regional Pond #1." However, instead of digging a deep hole and fencing it off, "the facility was designed as a multi-use pond." West Tallahassee gets a park and trail. The trail is already in place. It is ten-feet wide, paved with asphalt, and makes a 3870-foot circuit of the pond. The east side of the trail is bordered by the Oakside Park mobile-home village, and the south side by homes on Shuler Road, but much of the trail is bounded by woods. Eight spots on the outside of the trail have been prepared for the mounting of benches. A parking lot is already in place along US 90, but is currently occupied by construction vehicles. Landscaping continues, but sod and trees have already been planted. Cypress trees have been set along the water; right now the trees look like tomato stakes but one day they will line the pond like the columns of a cathedral. In that same happy future, the magnolia and live oak saplings planted on the outside of the trail will be providing shade. The trail already has a few users. As for the pond, local birds are not waiting for a ribbon-cutting ceremony. In three visits I've spotted doves, red-winged blackbirds, cormorants, great blue herons, american egrets, wood storks, and other birds on and around the water. You can find the trail across the highway from the Capital Center, 5050 West Tennessee Street, home to offices of the Florida Department of Environmental Protection and Department of Revenue--aka "Taxland." The park and trail should be immediately useful to workers at the Capital Center, being a pleasant site for a lunchtime stroll or for a workout before or after the business day. Blueprint 2000 has tentatively scheduled the dedication of the park for 9:30 am on 1 June 2009 and will be named Martha Wellman Park. Martha Wellman served on the Economic and Environmental Consensus Committee and was a Community Representative on the Capital Circle Southwest Project. Board of Leon County Commissioners agenda item to name the park "Martha Wellman Park"
Smiling Pig 5K. 8:00 am CT. Citizens’ Lodge Park, 4577 Lodge Drive, Marianna, FL 32446. Entry form and flyer.